The Urban Nomads: 63 Litres Used! That is all that I used for two weeks. I know that to many of you, you could go for a month on that. For me with a truck and trailer, however, that is good. Anyways, I did save considerable fuel this time, and only spent70 bucks. Compared to something near $150.00 for the same period, this is doing great. 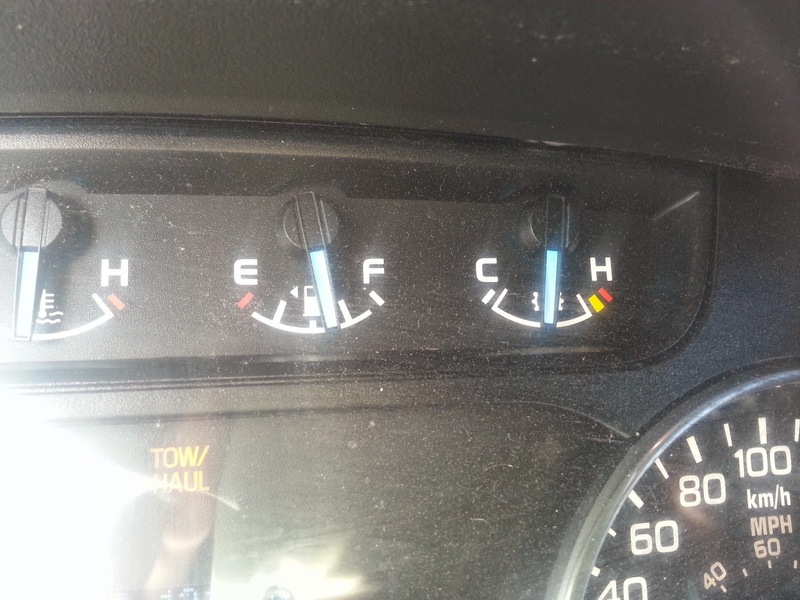 Here is what the fuel gauge looked like when I fuelled up. I wanted to pull out the BBQ and have a BBQ’d burger, perhaps the last BBQ for the summer. I even wanted (and still plan to) take a picture of me BBQ’ing in a Walmart parking lot. If and when I do, I will post it for sure. If anyone is in town, stop by and perhaps you can twist my rubber arm to BBQ you a burger. As a compromise I did pick up a grilling pan, one that I can grill a burger on my stove inside Wanda. This way I can grill the burger and drain the fat as it is cooking. It is nice to finally be able to have a decent burger but there is nothing like a burger cooked over a firepit. Hmm may have to do that soon too. I did park behind work last night and I will say that Sundays is the best day to do this. Why is that? Because what person works late on a Sunday? Seriously who does this? What this means to me is that I was able to park in the ghost town that was work at 7:30 last night as opposed to 9:00 usually. I think I will indeed make Sunday my plug-in day. I did make sure to top up my water and will not make the mistake not to do so again. Things are settling into a nice rhythm and I am truly liking this lifestyle. Wherever I go, I am home, I never need to pack when going somewhere. As well shopping is easy as I never make a grocery list. I just look at the cupboard or fridge and say “hmm, I am out of [whatever]” and just walk across the parking lot and get that. I am usually either in or near the parking lot of a place that sells food. I am picking up speed on my credit cards and it seems that at worst I will be able to put $1000.00 per month on each one. So in five months the second one will be done. Well that is 5 months of being in Wanda. When and if I am forced to move into a room to rent that will likely drop to next to nothing. As far as writing goes, it still progresses. I got half a chapter done today and that is okay. As long as I make progress daily, I am succeeding. I am nearing a place where a nice pause in the story would suffice. I could make this the first book or rather just mark it as part one of two parts in the book. Hmm, not sure, any suggestions would be appreciated. It is raining today and looks like it will get cold this week, perhaps as cold as -7 C. I will be okay and that night I will set the furnace to 50 - 60F. You know, just enough to keep the water lines from freezing. Next week it will pick back up above zero. This is just an early taste of the cold stuff to come.